In the recent past, Winnie Nwagi has been accused of losing too much weight by fans. These accusations picked up when the 'Matala' singer appeared as a guest artist at weekly comedy show weeks back. The mom of one posted pics of her performance on Instagram and the fans thought she was losing weight, matters were made worse when they insisted she was losing weight on sections of her body. 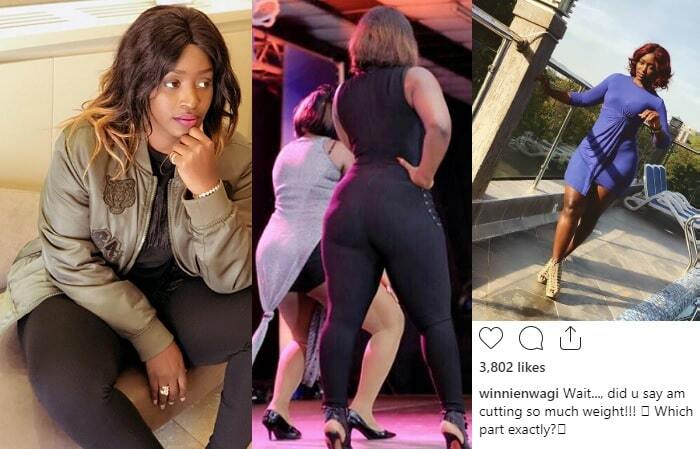 The singer who has been representing the plus models is tending towards the skinnier direction something that is worrying them now that they were used to the not so portable Nwagi. "Wait...Did you say am cutting so much weight!! Which part exactly?" She is pretty much aware of the part, but she just wanted to be sure so that the next time she is working out, that part could be spared as much as possible. "The part down the waist. ""Your Azz to be specific." However, not all were on the same page as some seemed to like what they were seeing. "Your body, your size goals! Don't let nobody tell you how big or small you should be! Love this size though," Actress Eleanor Nabwiso commented. "Winnie, I love what am seeing, better go back to your weight when you sung Science with Gravity." Winnie Nwagi is behind songs like; 'Fire Dancer' a collaboration song with Nigeria's Slim Prince, Kibulamu, Munange, Bunsosomola, Musawo, Science and Show Me among others.